The plantar fascia is a ligament-like band running from the heel to the ball of your foot. This band pulls on the heel bone, raising the arch of the foot as it pushes off the ground during walking or running. 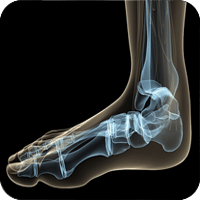 But if your foot moves incorrectly, such as in the case of foot pronation, the plantar fascia may become strained, irritated, inflamed and very painful. There are 26 bones in each of your feet. When these bones shift out of alignment, the arches may begin to fall, causing further shifting and alterations. A chiropractor can adjust the bones of your feet back into alignment. Ultrasound therapy has been very effective in reducing inflammation and enhancing soft tissue healing. Acupuncture is a particularly helpful treatment in relieving the pain of plantar fasciitis. Ice may also be recommended to help reduce pain and inflammation. If left untreated, the plantar fascia may swell and its tiny fibers may begin to fray, and become weakened, causing more inflammation and pain…and even more foot pronation. The body’s attempt to strengthen this problem results in calcium deposition within the weakened and torn fascia fibers resulting in a heel spur. It’s needless to say that walking can be extremely painful when a heel spur is present. Peroneus Longus and Brevis tendonitis can also cause you to have pain at the instep of your foot. This condition is treated similarly using deep tissue stripping and ultrasound therapy to the affected tendons. Home care is a must with this condition and Dr. Hoch will show you how to stretch and massage your foot and leg muscles to improve flexibility, blood flow, and soft tissue healing. I came to see Dr. Hoch because I was having pain in the arch of my right foot and my right hip for about 3 weeks. She diagnosed my condition as Plantar Fasciitis. I was taking Excedrin for pain which was a 7 out of 10. Dr. Hoch recommended custom orthotics, stretching, adjustments of my back and ultrasound. I came 3 times in about a week and a half and I’m already feeling 80-90% better. My impression of Dr. Hoch, her office and chiropractic in general is really good, that’s why I keep coming back! My wife and daughter come here as well and I have told a couple of neighbors about chiropractic. ~J. K.
After my 2nd session of Acupuncture, my pain was gone! I had plantar fasciitis – which was this terrible pain on the bottom of my foot and heel. The pain was so bad that I couldn’t even put my heel down on the floor. This started due to my increased time on the tennis court. So I mentioned it to Dr. Hoch, and initially she recommended stretching and physical therapy, as well as replacing my shoes for Tennis. By following Dr. Hoch’s treatment plan, it absolutely helped reduce my pain by about 60 %, but it was still persistent. So we discussed a different course of action and she recommended trying Acupuncture. After my 2nd session of Acupuncture, my pain was gone! ~M. T.
I cannot believe how quickly it worked! !